The 3rd Bryan Ferry Solo album Let's Stick Together was released in 1976. 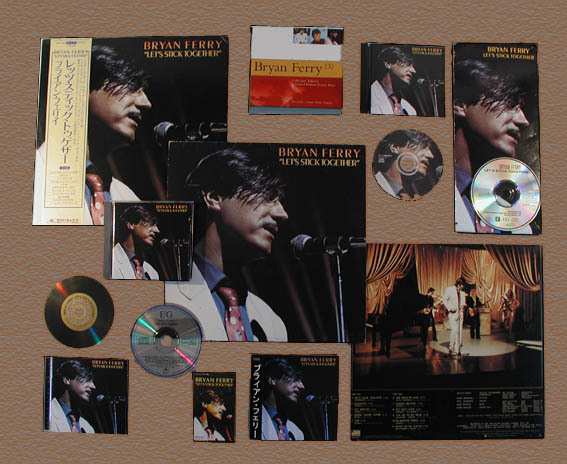 This album is a collection of 2 singles and a 4-track EP and the B-sides to 4 of the first 5 Bryan Ferry solo singles, plus a re-recording of Roxy Music's Casanova which was later used in 1978 as the B-side to What Goes On. The album peaked at number 19 in the UK album charts. You Go To My Head reached number 33 whereas Let's Stick Together peaked at number 4. The EP containing The Price Of Love, Shame Shame Shame It's Only Love & Heart On My Sleeve reached number 7 in UK. The Price Of Love was released as a single in most European countries. Heart On My Sleeve was released as a single in USA. Rick Wills Bass On "Sea Breezes"
John Porter Bass On "2HB"
Ann O'Dell String Arrangement On "Shame Shame Shame"
Phil Manzanera Guitar on "Re-make/Re-model"
David O'List Guitar On "Chance Meeting"
Neil Hubbard Guitar On "Casanova"